As we were checking out the latest demo cars from CES 2016, we were noticing that no vehicles had kick panel speaker installations anymore, but why? Then we came across Klifton Keplinger’s newly revised Infiniti G35 at CES. Kick panel speaker installations were seen in every Sound Off Competition throughout the early 90s, but you rarely see it nowadays. Why, did Klifton choose to use the old school design of kick panels? 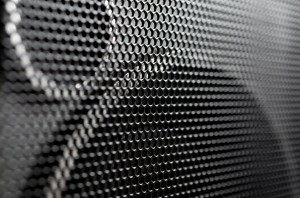 Speakers in Kick-Panels – Now an Old-Fashioned Technique? When a speaker system is placed in an automotive environment, we hear the direct (shortest path) and reflected (longer path) sounds, such as resonances and reverberations. The two sounds are processed by the brain as one sound, and this influences our perception of height, width, and depth of soundstage, as well as rearward ambiance. For this reason, the off-axis radiation pattern of any speaker in a vehicular environment has a significant influence on how natural the music sounds. Most mobile audio sound systems benefit greatly from having the front stage speakers at least partially “off-axis.” Off-axis means that the speakers are not pointing at you, but rather at some angle less than 90 degrees away from you. X = distance from the center of the left speaker from your left ear. Y = distance from the center of the right speaker from your right ear. Z = path length difference (always a positive number). Applying this formula, assume that the distance of the left speaker from your left ear is 140cm, and the distance of the right speaker from your right ear is 100cm, the path length difference is 40cm. Good stereo imaging is completely dependent on arrival times of the fundamental vocal frequencies. Differences as little as 10 microseconds can be detected by the brain. A PLD of 30 centimeters equates to the sound from the nearest channel arriving about 0.9 milliseconds earlier than the furthest channel. It is my opinion that the end-user should try to keep PLD’s to less than 30 centimeters in a vehicle which is intended to have good imaging and staging character from both seated positions. The best way to go about evaluating certain locations in your vehicle is, in general, to look for the potential locations as far forward and away from you as possible, but still with a general “line of sight” to the speakers (particularly the speaker on the far side of the vehicle). An easy way to test various potential locations is to hold a tape measure or other measurement device from the potential speaker mounting locations and measure those locations with respect to your ears. In scenario “A”, we show the installation of the speakers in the dashboard, high in a door panel, or in the A-pillar. As you can see from the diagram, the PLD’s between the left and right speakers are large, due to the proximity of the listener to the near-side speaker. While the mounting of primary drivers in the dashboard or A-pillars has become increasingly popular, this configuration will undoubtedly require both time and intensity domain equalization in most vehicles to ensure a good, focused center image, properly located in the center of the vehicle for one seated position. Read digital signal processing, and more importantly, someone that knows how to set it up! There are, however, some rare exceptions, and you may actually find that the dashboard locations provide the best equalized PLD of the available mounting locations, such as the VW Beetle; this is very rare though – in our experience, less than one percent of vehicles on the market today have optimized dashboard speaker locations for the midbass drivers. 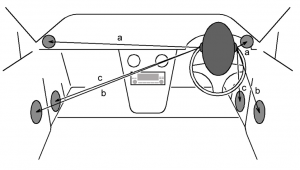 In scenario “B”, a typical door installation location is shown, and in many vehicles represents a good improvement in PLD’s from the dashboard, high in the door panel, and a-pillar location identified in scenario “a.” In most vehicles door-mounting represents merely a “decent” location to mount speakers; not ideal but satisfactory. The door speaker installation scenario will likely also require some amount of time and intensity equalization to ensure a centered image in most vehicles; this can be as simple as adjusting the balance control on your source unit, to more advanced ways of digital time and intensity manipulation. The problem with doors, although having better PLDs, is that doors are noisy, have an abundance of rattles, are difficult to fully seal front and back waves, and represents a very ‘moist’ environment due to drips and drabs during precipitation events. The third and final potential mounting location as shown in this diagram (scenario “C”) represents a kick panel installation, where the speakers are placed far forward in the a-frame cavity of the kick panels, present in most vehicles. While it is not immediately obvious looking at a two-dimensional drawing, in many cases the kick panel location affords the best equalization of path length differences for most vehicles. The lesson to be learned here is that by taking a few moments to evaluate the potential mounting locations in your vehicle, in a very short period of time, you will be able to find the best location for your speakers by determining the location with the smallest PLD. Kick panels must at least be considered in virtually every high-performance build! There are two very important caveats for some people regarding kick panel installation. The first, and least remembered by the majority of online enthusiast, is that RHD vehicles has their throttle pedals much too close to the RHS kick area to accommodate any decent sized enclosure. Trust me, I’m in a DRIVE ON THE LEFT country! Second is PLD of kicks in a minivan, bus, older SUV’s (like I have) and very tiny cars. In an suv like mine (LHD) the left kick is at a sharp vertical angle down. Sitting in your seat like a dining table chair. Also because of the width of the vehicle (Toyota Landcruiser) the right side kick is waaayyyy over yonder!!! Achieving a 20″ PLD is a great feat (lol). In a shorter vehicle you sit quite low and legs are outstretched. Possibilities are greater.